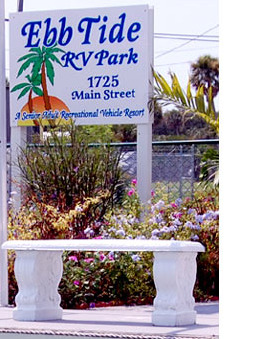 Ebb Tide RV Park is an older, senior adult RV park that is close to beach. Many of our guest walk to the beach daily. 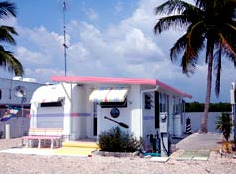 We are with in walking distance to the Key West Ferry Boat for fast, daily 3 1/2 hour trips to Key West. We are located on Main Street in Fort Myers Beach, Florida. Ebb Tide is a medium sized RV Park (148 sites) aimed at senior RVers. The park is open year-round and leashed pets are always welcome. Ebb Tide RV Park is close to many area attractions. Salty Sams Marina (full service), Parrot Key Caribbean Grill waterfront restaurant and the Key West Express ferry service to Key West are all directly across the street. Fort Myers Beach is just minutes away by car.